A personalised baby metal wall art mounted within a box frame. Available with white or black frame. 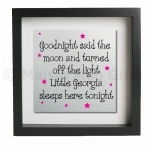 A personalised new baby metal wall art mounted within a box frame. Available with white or black frame and with pink or blue footprints. 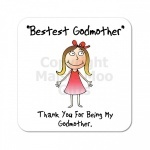 A personalised Bestest Godmother mug design. 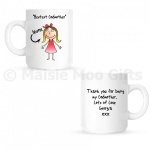 This mug is a great personalised gift. A pair of personalised godfather cuff links. Great for a thank you gift with gift box included. A personalised metal tie slide with a Bestest Godfather design. Great for a thank you gift and comes gift boxed. An excellent quality keyring with a unique Bestest Godfather design. An excellent quality keyring with a unique Bestest Godmother design. 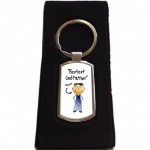 An excellent quality personalised keyring with a footprint new baby boy design. An excellent quality personalised keyring with a footprint new baby girl design. A personalised bottle opener keyring for a Godfather. A personalised bottle opener keyring for a Godmother. 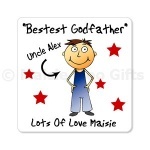 This magnet is personalised with a cute godparent design. Great for a thank you gift. Available for godfather or godmother. 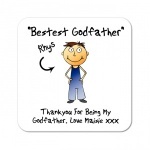 A personalised wooden coaster featuring a Bestest Godparent design. Available for Godfather or Godmother.